There’s nothing quite like having a look at the excessive price tags of the filthy rich to brighten up your day. Whether you’re stalking their engagement rings, weddings or just their day-to-day outfits, you’ll be guaranteed to be in for a shock. Do these people even know what a budget is? Now, prepare yourself for some hefty price tags, because we’re about to divulge some of the most expensive wedding cakes of all time. Meanwhile, we’ll curb our cravings with a $4.40 Woolies mud cake. It’s the simple things in life, right? Kim Kardashian’s first wedding was as big as you’d have expected. Heck, the cake alone was $20,000 and a staggering 8 feet tall. It was a black and white design with each tier coming in an octagonal shape. And to think it was all for a 72-day marriage. Bold and colourful, this wedding was far from traditional, and you know you can count on the cake to make a statement. Coming in at $40,000, the cake was black and white with a total of 12 tiers. It was decorated with purple and red edible sugar flowers and sterling silver leafed stripes. As ridiculously extra as this wedding is, did we really expect anything less from Liza Minnelli? This Colombian beauty’s wedding to absolute hunk Joe was as incredible as you can imagine. Following a cake buffet of our dreams at the rehearsal dinner, the main event had a cake made by the prolific Sylvia Weinstock. The white, 5-tiered cake was decorated with a heaping of flowers, and while we don’t know the price, we can get a rough estimate. According to CBS, a basic Weinstock cake costs about $3,000, but the more elaborate, the higher the price. A cake with flowers or a crazy height can come in at an easy $50,000. We just hope it tastes as good as it looks! Gucci Mane’s wedding to Keyshia was every bit extravagant, and honestly, we don’t think anyone else will top this one. With a $1.7 million price tag, you can bet their cake was something out of a dream. With four-tiers spanning over 3 metres, the cake came in at a whopping $75,000. Why? How? It’s just butter, sugar, flour and milk, right? Well, this wedding cake had a bit more than that. Think 8,000 handmade sugar flowers and 2,500 Swarovski crystals in between each tier. Heck, the cake was so big they used a sword to cut it. Following in his parent’s footsteps, William’s wedding was a whopper of an event. Sitting on a comfortable $32 million, their 8-tier cake came in at $80,000. The price tag comes with over 900 leaf and floral accents, and we’re not talking any old generic flower, but 12 different ones that hold a special place in the hearts of the young couple. Some of these flowers included the Irish shamrock, English rose, and the sugar lily. I don’t know about you, but we can’t seem to justify that price for a fruitcake. This iconic wedding will literally never stop being on our minds, and for good reason. Putting aside every other over-the-top detail, the couple had 27 wedding cakes, with the main one coming in at £56,000 (roughly AUD$99,000) and standing at over 5 feet tall. It was decorated with Charles and his family’s coat of arms, the couple’s initials, and flowers. It apparently took a whopping 14-weeks to make. 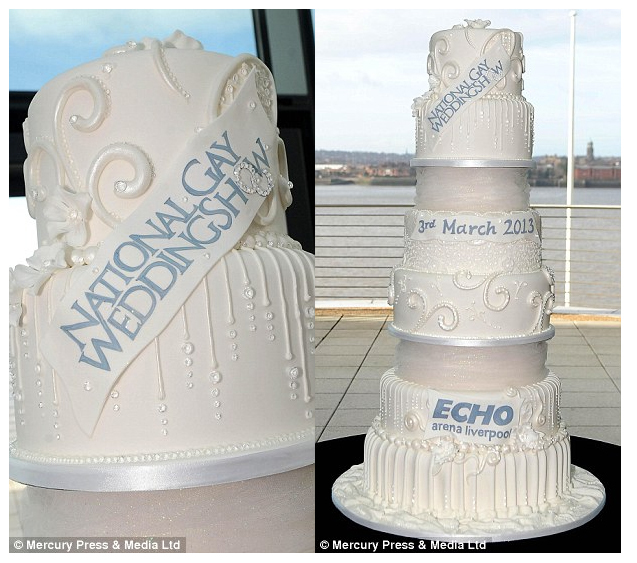 Now, this last cake wasn’t technically at a wedding, but it was created for the National Gay Wedding Show, and it is considered the world’s most expensive wedding cake. This 8-tiered cake was decorated with a meagre 4,000 diamonds. Nothing, right? Well, nothing totalled up to be a wonderful $52 million. Yep. Nothing.